The Serac Sequoia Extra Wide hammock is an open, three-panel fabric hammock that is gathered at the ends with short rope loops. The compression stuff sack includes a whistle buckle and cinch top. There are three small webbing loops sewn onto each long edge. The fabric is a soft, diamond-ripstop nylon with a silky hand. The hammock also comes with daisy chain webbing straps. I’ve reviewed a few recreational hammocks in the past few months and really haven’t been overly impressed. I’m often left shrugging my shoulders and saying, “meh.” Nothing overly amazing nor negative. There are literally dozens of look-alike hammocks flooding the market and there’s not much to say to distinguish them. When I received the Serac Sequoia to review, I tossed it in my review box along with the others wondering how I could write yet another parachute nylon hammock review that sounds somewhat different. However, after opening the package, it was clear that the folks behind Serac put a little more thought behind their hammock than I had guessed. For starters, the fabric isn’t the run-of-the-mill crinkle taffeta “parachute nylon” fabric everyone else (including brand leaders ENO and Grand Trunk) is using. The fabric is softer, more subtle, and uses a diamond ripstop weave that strengths the lighter fabric and helps give it a 500 lbs (227 kg) weight rating. 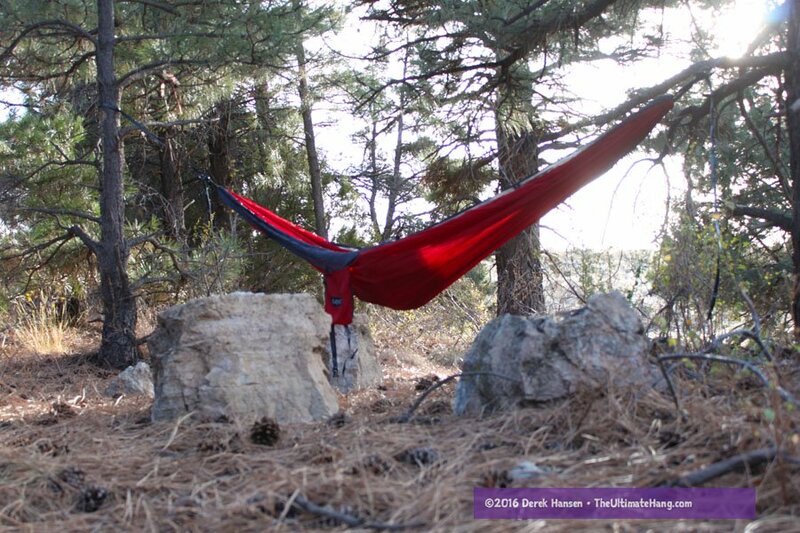 The fabric is very similar to the Tribe Provisions hammock. I was also surprised to see webbing loops sewn along the long edge. These are great for tying on some shockcord guyline and pulling open the hammock, similar to the Hennessy Hammock, attaching an underquilt, or clipping on a gear hammock saddle bag. The fabric really packs down small too. I don’t really care for compression straps as the resulting ball shape doesn’t form well in a backpack. Instead, I just toss the hammock in my pack and let the stuff sack’s fluid shape conform to the nooks and crannies in the bag. Still, the addition of the whistle buckle is a nice touch for some multi-use gear. I’m also impressed that Serac included viable suspension and easy-to-use wiregate carabiners in the kit. The price point with the strap (and unlimited 5-year warranty) really makes the Serac Sequoia hammock a fantastic deal. Suspension and Anchor System ♥ ♥ ♥ ♥ ♥ Includes robust rope loops, wiregate carabiners, and webbing straps! Construction and Craftsmanship ♥ ♥ ♥ ♥ ♥ I love the diamond ripstop fabric: soft and comfortable. Aesthetics ♥ ♥ ♥ ♥ ♥ A variety of color combinations. Price and Value ♥ ♥ ♥ ♥ ♥ This hammock is priced less than the competition and includes webbing suspension. Is it cool that their website is plastered with your illustrations? Is it possible to find the weight or thread count of the fabric? You find nothing on their website, nor the specs on the fabric. I’ve sent a note to them to see what they say.